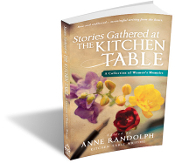 BOOK: STORIES GATHERED AT THE KITCHEN TABLE: A Collection of Women's Memoirs $15.99 plus shipping and handling. Bold women from Kitchen Table Writing share stories that led them to confidence to become business women, leaders, mothers, healers, and trendsetters. In the safe haven of Kitchen Table Writing, these young creators and seasoned innovators create life stories that empower and resonate with women across generations.